ABC figures: Newspaper sales continue to fall but can digital save the day? No alarms and no surprises; the latest Audit Bureau of Circulations figures reveal more of the same for the newspaper industry. Print circulation has continued its backwards drop, with digital continuing to buffer the losses in print. For print sales, Fairfax's total metropolitan newspaper network fell 11.97% over the year to September, according to the latest data, with total sales of 1,194 million. News Limited only fared slightly better, with a drop of 8.09% and 4,179 million total sales across its metro network. Similarly the West Australian's newspaper sales dropped 7.47% year on year with 416,881 total sales. 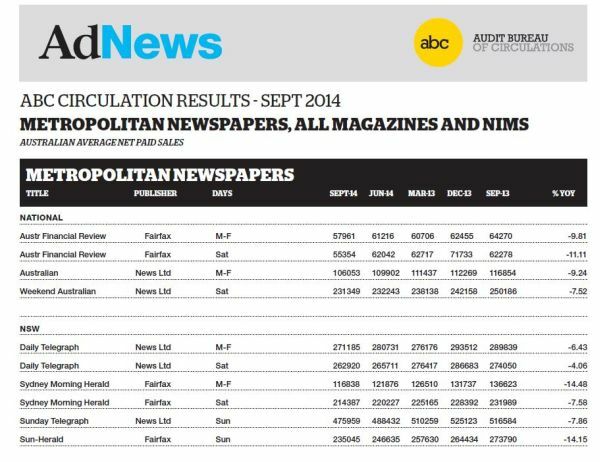 The ABC figures also showed that individual titles are not faring better in print sales, losing sales a consistent rate, no matter the publisher or the region. Fairfax's The Age recorded the biggest circulation drop year-on-year for its weekday print sales, falling by 19.63% to 107,678. Its Saturday edition fell 8.24% to 182,187 and the Sunday Age fell 11.59% to 148,330. The Sydney Morning Herald recorded a loss of 14.48% in its weekday print sales (116 838), 7.59% in its Saturday edition (214,387) and the Sun-Herald dropped by 14.15% to 235,045. The Australian Financial Review saw a decline of 9.82% in its weekday print sales to hit 57,961 faring better than its Saturday edition, which dropped 11.12% to 55,354. 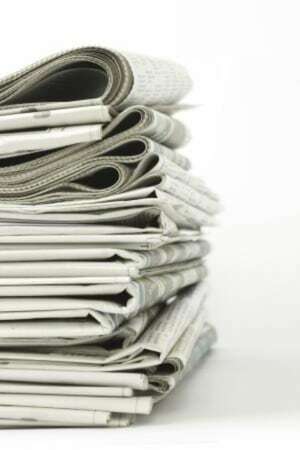 News' Northern Territory News recorded the biggest drop in its network for print sales, falling 16.29% to 21,190. Its major metros, The Daily Telegraph lost 6.44% Monday to Friday, 4.06% on Saturday and The Sunday Telegraph lost 7.86%. In Melbourne, declines were similar with the Herald Sun falling 8.63% to 365,133. However, the addition of paid digital and print-digital subscription packages to the total sales offset some of the declines. In terms of overall sales, The Age weekday and Saturday edition, the Sunday Age, and the Sydney Morning Herald weekday all experienced total masthead year-on-year growth across print and digital combined. The biggest growth was from the Sydney Morning Herald which rose 6.62% to reach 213,895 in total sales. Not far behind was The Age weekday edition which jumped 4.08% to reach 202,460 in total sales. The biggest total decline was The Northern Territory News which dropped 16.22% in its Saturday edition to hit 21,664 in total sales. In the major mastheads The Australian dropped 1.56% to reach 166,395 for it's weekday edition total sales. The Weekend Australian fell 4.56% to hit 282,772 in total sales. Melbourne's Herald Sun fell 7.01% (402,481) in total sales for its weekday edition, 7.28% (397,042) for sat and Sunday Herald-Sun dropped 8.3% (456,186) in total sales.